The above softball coffee mugs are popular because you can type in ALL Softball Player’s NAMES and Jersey NUMBER, One softball mug at a time, into the text boxes to the right of each softball coach mug. CALL Designer Little Linda Pinda: 239-949-9090, if you need help customizing it. Copy all the names and numbers in your list to make it easier to customize. Your softball coaches will LOVE these softball coach presents. Change the Background and Text Colors to ANY COLOR or Call Linda to make design changes for you. No extra cost for my free design service on any of Zazzle’s customizable gifts. This softball coach gift just might be one of the best they’ve ever received from the team and parents. I designed a few Personalized Softball Coach Gifts with a Photo Template to add your own team photo. Click the tiny blue word “Change” underneath my temporary image and proceed to follow prompts to “Upload New Images” then select YOUR PICTURE from computer and Click “OK”. I carefully proportioned the image size to fit a typical photo. 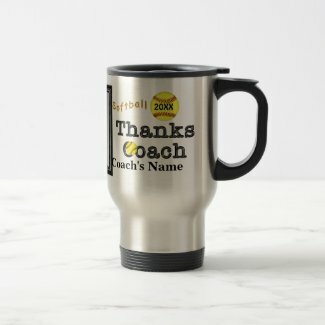 Some really cool and Great Softball Coach Gift Ideas with Coach’s NAME and YEAR. Personalized softball coach gifts are such memorable gifts for Softball Coaches. 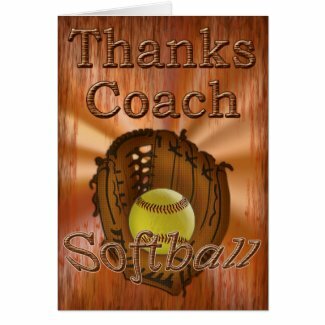 Personalized Softball Coach Gifts for Men and Women. Coach Softball Jackets, Softball Coach Hats, Mugs, Keychains and more. These matching Softball Coaching Gifts do NOT need to be personalized but the are customizable if you want to. Just click the blue “Customize” or “Personalize” Button or Links for lots of custom options. 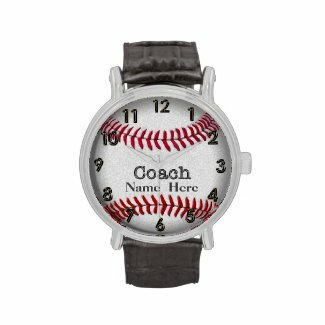 More Softball Thank You Gifts and other Softball Gifts Under $5 for your coach, Watches and more. Be sure to look at ALL sides of these cool Stainless Steel Coffee Mugs. No plastic inside the mug to worry about. Make great Softball Christmas Gifts, Softball Birthday Gifts and cool party ideas. Once you are at the main page of my shop, Click On the Individual Product Category Image and when available, click on the Sub-Category Image near the top of each Category. Links are also located on the left side of the page. 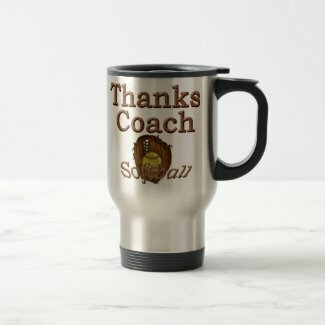 “Thanks Coach” Softball Coach Stainless Steel Personalized Mug. Incredible detailed printing. This is not only a cool and fun gift to receive but it is a very practical gift too that will be appreciated on a daily basis. Every time your coaches look at their Personalized Coach Mugs they will think of you and your team. 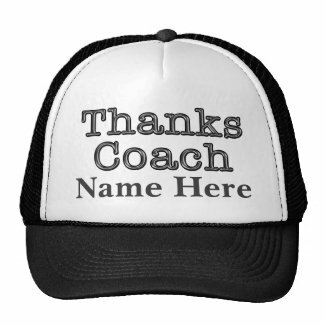 Great Softball Coach Gift Ideas with Coach’s NAME and YEAR. 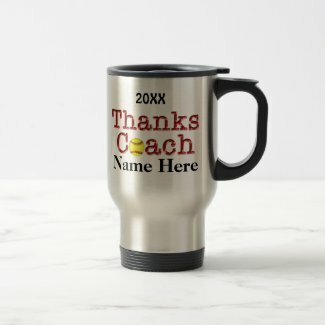 Just Type in YOUR COACH’S NAME and the YEAR in the Text Boxes below the “Personalize it” Section which will be located to your right once you are at the Coach Mug product page. FRONT View of this Softball Coach Mugs. These are Quality Coach Mugs with AMAZINGLY Detailed Printing. Stainless Steel INSIDE and OUT, not some inexpensive plastic lined mug. The Lid even turns to close for easy use. Keep their beverages Hot and Cold and handy. They fit nicely into standard size cup holders. Softball Coach Gift Ideas with Coach’s NAME and YEAR. You want to show your Softball Coaches how much you appreciate their time and dedication to training you to be the best softball player ever but you don’t know what to give them. Extra special Gift Ideas for Softball Coaches for both Men and Women. Your softball coaches will absolutely love these softball watches. You can also totally delete any of the temporary text by highlighting the temporary words and DELETING it. If you wish to make bigger changes to the design, Click the “Customize it” Blue Button and proceed to your right under the “Customize it” section. There you will see How to Personalize Coaches Gifts further. Cheap softball coach gifts to give at the end of softball season party. Original designs are by me, Little Linda Pinda. These gifts are created specifically to show just how much you appreciate your softball coach. They make really cool Softball Christmas Gifts. The designs vary with some having YOUR COACH’S NAME, YEAR and maybe a short message text box. Quickly and easily type in the your Coach’s NAME, YEAR and when available, short message. Would like to see everything that I have designed for my Little Linda Pinda shop? Not just sports gifts but LOTS of other Personalizable Gifts for your entire family. Anniversary, Milestone Birthdays and occasions, Photo and Personalized gifts and so much more. 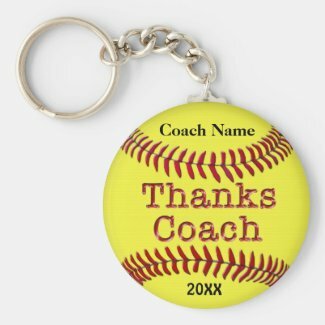 I created Softball Coach Gifts for both Men and Women Coaches or some of the presents are great for either, such as the Yellow Softball. 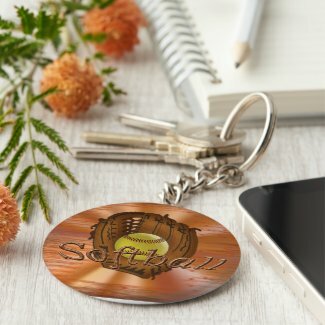 Since my silver basketball gifts were so popular, I decided to design Silver Softball stuff too, not only for coaches but for players and fans too.